Steven (Chicagoland, United States) on 4 June 2012 in Architecture and Portfolio. Constructed between 1906 and 1907, the Garfield Park Conservatory was designed by Chicago's general superintendent and chief landscape architect, Jens Jensen in collaboration with Prairie School architects Schmidt, Garden and Martin and the New York engineering firm of Hitchings and Company. It represents a unique collaboration of architects, engineers, landscape architects, sculptors and artisans. Today, the Conservatory still follows the original tenets of Jensen. One of the most popular rooms is the first presented to visitors, the Palm Room. In it over 84 different varieties of palm trees can be found from the over 2,700 known to exist today. Of particular importance is the double coconut palm first grown by employees of the Conservatory in 1959. The double coconut palm is only found off the coast of South Africa in its native environment and produces what is believed to be the largest seed of any plant in the world weighing up to 50 lb. The double coconut palm at the Conservatory died of currently unknown causes in February 2012. After many decades of neglect, the conservatory underwent a multi-million dollar restoration in 1994. 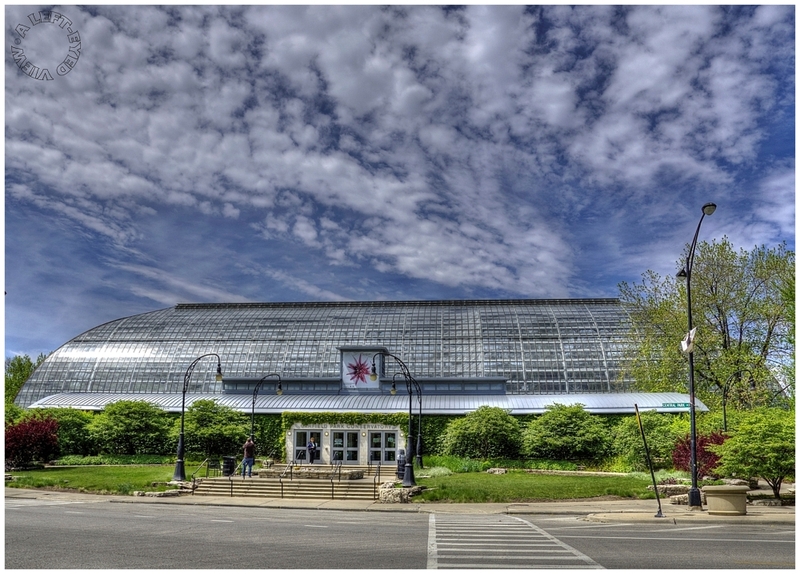 The non-profit Garfield Park Conservatory Alliance formed to help maintain the structure and provide programs and services for visitors. In a hailstorm on the night of June 30, 2011, the Conservatory suffered catastrophic damage to glass in showrooms as well as production houses where plants are grown or stored. Five recently-renovated showrooms contained laminated glass and therefore sustained less damage. Some areas were reopened to the public on July 3, 2011. Wonderful image for a wonderful conservatory. Great colors! Marvellous view and I like how you step back to use the road in the composition. Special sky as well! Very nice capture and HDR processing. Interesting background information as well. There was me thinking that Garfield was a cat! Beautiful details and colors - nicely done, Steven! An excellent image and informative read, Steven! Very beautiful architectural design ... I wish we had one in our area ~ fantastic clarity and beautiful shot! This is a place I would surely appreciate visiting ... great shots. A beautiful image of this elegant structure. It's interesting about the hail damage which is not a small worry in the Mid-West. It has a typical design from that period, quite beautiful, and still standing. Gorgeous architecture. Beautful. I am sorry that they was so much damage to it from the hailstorm. Wonderful composition. I love the beautiful clouds above the smart building. Yikes, not a good place to be in a hail storm. Nice shot.